Do you ever wish you had a guidebook on what to say? In a disagreement with your spouse, talking to a teen or having a conversation with your staff about a topic you suspect they won’t like, do you ever wish you had a guidebook on what to say? I wish for that too and after careful searching I have found that husbands, kids and staff teams sadly don’t come with guidebooks. However, I do have the next best thing for you! The staff is afraid to put their best ideas forward. We all agree that innovation is the right thing to do but no one has the time to even take the first step. Everyone is busy running around doing this innovation-thing but still we don’t have much to show for our effort. If one of your goals is to be more innovative at your association you will be interested in the latest association industry data. Data that can help you see the most common stumbling blocks for innovation before they are even placed in your path. Stumbling blocks like white spaces, fixed-mindsets, lack of focus and more. 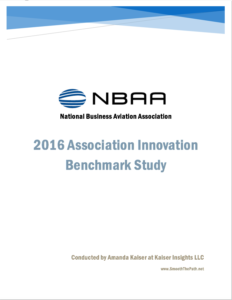 The National Business Aviation Association (NBAA), an innovative association, generously sponsored a two-part Association Innovation Benchmarking Study. I conducted the up front qualitative study and Marketing General Incorporated (MGI) used these insights to formulate and field the second half qualitative survey which will be available publicly very soon. In the qualitative study we learned that innovation at associations is quite variable. Because associations are so different there is often no one correct association-way. In some cases we can draw conclusions about what works best and where we can’t, it helps knowing the range of options at every stage of the process. These best practices and options can be used to start your staff team’s discussion about innovation and what it should look like at your association. You will also see through the stories of others like you what worked, what failed and how they felt about it. The 2016 Association Innovation Research Report is full of rich data, a resource swap, fascinating conversations and really interesting surprises. And it is nice and long; 37-pages. So grab your popcorn and dive in! The full report is available to anyone, no strings attached, for free (thank you NBAA) and we won’t even collect your email address. But I am available for questions about the results, just contact me. Access the report with just one click here: 2016 Association Innovation Research Report. Happy reading, thinking and planning!